The Park: Unlike Black Canyon, Bryce is a wide-open amphitheater populated by thousands of “hoodoos,” pinnacles, fins and buttes. The park’s hoodoos, brightly colored rock spires carved by the elements over millions of years, will mesmerize you with their invitingly warm yellow, red, pink and orange hues. Legend has it that these spires were once animal-like creatures that turned themselves into people. But once transformed, they turned evil. As punishment, the Coyote changed them forevermore into stone! Getting there: One of Utah’s “Mighty Five” National Parks, Bryce is located in the southern section of the state off of UT-12 about two hours northeast of St. George, UT. When to visit: Summer draws large crowds. Wildflowers are abundant in the spring and early summer. Winters cloak the hoodoos with a frosty coat of snow. 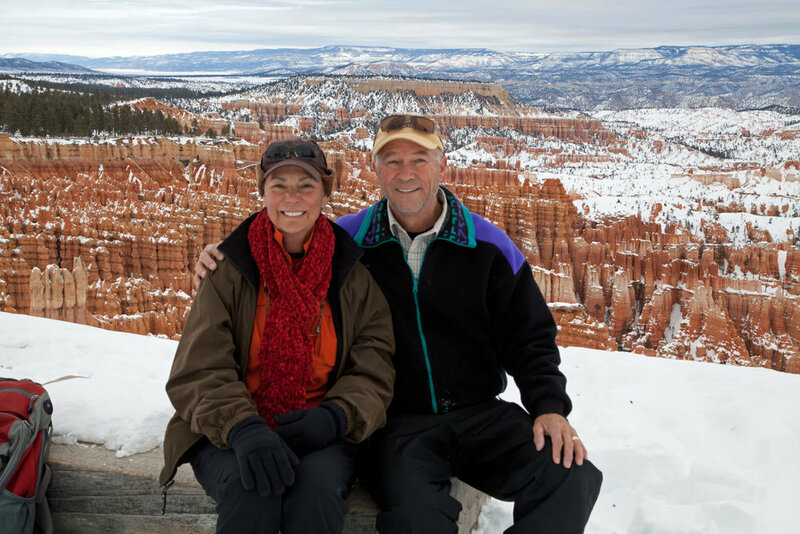 What to do: Bryce Canyon is open year round and whether you embark upon a snowshoe hike in the winter, full moon hike in the fall or a hike down into Bryce Amphitheater, you will be treated to a landscape full of staggering natural beauty. Scenic Drive: If you’ve only got a half-day to visit this park, be sure to take the 17-mile scenic drive out to Rainbow Point. Along the way, stop at the many overlooks and view the vibrant colors and unique shapes of the canyon below. Dark Skies! Located far from city lights, this park has become known as one of the world’s best sites for stargazing making it possible to view thousands of stars with the naked eye – three times the number generally visible. Trails to hike: For day hikers, there is an abundance of opportunity to explore Bryce, whether along the rim or down into the canyon itself. Trails into the canyon range in difficulty from easy/moderate to strenuous. Strenuous hikes are those consisting of steep grades with multiple elevation changes and include the 8-mile Fairyland Loop and the 5-mile Peek-a-Boo Loop. Rated “easy to moderate,” the 1.8-mile round trip Queens Garden Trail is the least difficult path down into the depths of this colorful canyon. Where to stay: Bryce has two campgrounds, both located in a Ponderosa Pine forest with plenty of shade and sunshine. The Sunset Campground is closest to the best hiking trails and offers 100 campsites. The North Campground is near the Bryce Canyon Visitors Center and offers 99 campsites. The Lodge at Bryce Canyon is an architectural treasure and is listed as one of the 16 Great Lodges of the National Parks. The rustic western cabins are charming! Nearby Ruby Inn is also a good lodging option. Phoenicians loving the cool weather! Park visit #5. Memorable Moments: Hiking the Queen’s Garden/Navajo Loop Trail amongst the hauntingly beautiful, grotesquely shaped hoodoos! Visiting Bryce in the winter of 2016! Trivia: Mountain Lions have one of the highest hunting success ratios of any predator. 80% of the time they chase a deer, the deer ends up as food. At Bryce Canyon, Mountain Lions are most often seen in winter. Hike the Rim Trail to Sunrise, Sunset, Inspiration and Bryce Points!